Joe Lauro is a man inspired by music. He’s also driven to share it with others. 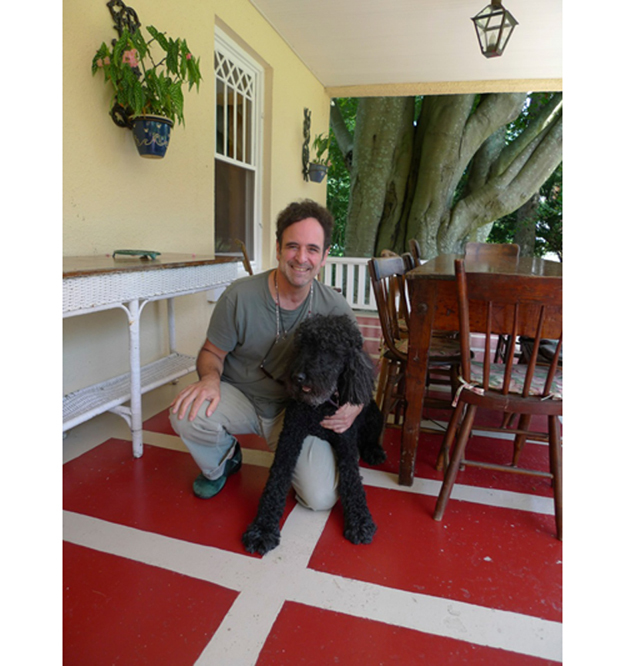 Before selling his Shelter Island home and moving to Sag Harbor a few years back, Mr. Lauro frequently hosted live music events in the barn on the property where he lived for 15 years. PETER BOODY PHOTO | Joe Lauro and friend Jabbo on the Lauros’ front porch. Ever since he was a kid growing up in Brooklyn and later Massapequa, Joe Lauro has marched to the tune of a different drummer. What kid in the 1960s would have been so fascinated by “The Jolson Story,” the 1946 biopic about the son of a cantor who rose to super-stardom singing in blackface about the Swanee River? “I was nine years old when I first saw it,” he said during a front porch talk on North Ferry Road last week. “It really made an impression on me. I wanted to know about that era” of music in which Jolson had come of age. His way was to explore American music of the early 20th century and collect records, images and film clips from those early days. He’s still at it and, by the looks of things, making a good living with his company, Historic Films Archive, a service featuring historical footage of the nation’s greatest bands and musicians that has provided “hundreds of thousands of clips to award-winning documentaries, television programs, feature films, and television commercials,” according to the company website. He’s also a documentary filmmaker whose works have been featured on PBS and who’s now at work on a film about Fats Domino for which he is seeking Kickstarter donations; an internationally known collector of “shellac,” which is to say 78-rpm records; and a musician with his own professional band, the Hoodoo Loungers, a New Orleans “Mardi Gras-style party band,” according to its website, that will be among the many bands playing at the annual Shelter Island Beach Blast, which is coming up at Wades Beach on the Saturday after Labor Day, September 7 from 3 p.m. to midnight to benefit the Island Gift of Life Foundation. The event, which started out as a private party and jam session in his backyard at the barn known as the HooDoo Lounge, has grown over the years to become the landmark end-of-summer party for Islanders and fall fundraiser for a local charity that quietly helps Islanders in need. Who knew in the early 1960s that Joe Lauro, the geek, would turn out to be cool? “My ultimate revenge,” he said, was spotting the guys who had been “kicking the [expletive deleted] out of me” out in the audience, rocking along with everyone else when he performed as a musician with a band. By then he also knew how to fight, something his father taught him how to do. A city corrections officer who became an administrator at the Brooklyn House of Detention, his dad, Joe, was one of a kind, too. He launched an arts program there, taking the “drugged out musicians, addicts and transvestites and putting on these shows with them. He was a real visionary. He got them books in a deal with the New York Public Library,” the younger Joe said. His mom, Isabella, was a housewife and a “strong Italian” lady. She and Joe now live in Florida, as does Joe’s sister and brother-in-law. He went to college at SUNY Plattsburgh, after which he applied for a job on Wall Street. He wore clogs to the interview. Questioned about the footwear, he realized, “I just couldn’t do it. I was so damned lucky” not to fall into a career he didn’t truly love. Instead he went to NYU’s prestigious graduate film school with the likes of the Coen brothers and Spike Lee, after which he went to work for Kino International, which operated a film archive service, and started living in the city. He connected through Kino with Patrick Montgomery, whom the company had hired to create modern trailers for some of the vintage art films it had in its collection. “We really hit it off,” Joe said. Montgomery, who had founded a stock footage and image service in the 1970s, hired Joe to run his archive service while he was busy making those trailers. That’s how Joe learned to run the kind of business he’s developed over the years as Historic Films, which he founded with a partner in 1991. They soon moved the business from the city to the East End because the partner owned a home in Southampton. It’s now based in Greenport. Joe met Karen Edwards, a member of a very old East End family who’d grown up on Shelter Island, at the Buffalo Road House in the city. He was playing tic tac toe by himself “and she joined me.” At the time, she was working as the manager of the Cornelia Street Café and had no plans to make Shelter Island a full-time home. But after she and Joe married in 1993, and he moved his company out east, it made sense to come back. They raised their son Oliver here. Now 18, he was about to head off to his freshman year at Ithaca College last week. Joe finds archival material for his business, and old 78s for his record collection, by working his vast network of connections, listening to stories and exploring whatever avenues turn up. Taking a shot in the dark, he once wrote Don Kirschner, the legendary music promoter, hoping to represent him in licensing “Don Kirschner’s Rock Concert” TV shows. Kirschner eventually showed up in a limo and took Joe out for dinner at the Palm in East Hampton. Nothing ever came of Kirschner’s business proposal — it turned out he wanted to buy Joe’s company — but he did introduce Joe to his current partner, Andrew Solt, who owned the rights to “The Ed Sullivan Show.” His meeting with Kirschner also led, in a roundabout way, to his eventually offering a rock-bottom price for the rights to Kirschner’s archive at an auction and winning the bid. The New York Times, Joe said, would soon print a story about his discovery of a trove of stereoscopic slides of famous performers such as Billy Holiday singing at tiny clubs, all shot in the years right after World War II by a professional photographer who happened to be a jazz fanatic. They came his way through a fellow record collector who sold them to Joe as part of a package deal. Joe has produced several documentary films, including “Somewhere Over the Rainbow,” about songwriter Harold Arlen, which was aired on PBS; “Louis Prima: The Wildest,” which ran on AMC; and “The Howlin’ Wolf Story” about blue giant Chester Burnett, which was released as a DVD. For details, go to http://kck.st/1a8npX2 or kickstarter.com and conduct a search.